My fourth "Sushi-a-thon" took place at Sushimoto, a small Japanese restaurant located right beside Holdom Station. Now, if you weren't specifically looking for the restaurant, you would most likely pass by it without even noticing it was there. Despite all this, it is popular among those who are looking for a convenient take-out, and it sets a high standard for aburi sushi (seared sushi) in Burnaby. I have been a regular at Sushimoto for a while and I'll admit that for a long time, I've thought that the restaurant was run by Japanese people until I heard the staff converse in Korean. Perhaps there might be a Japanese mastermind behind all the unique dishes Sushimoto has to offer. Sushimoto has a wide assortment of spicy items, while there is a limited selection of hot food items. Years ago, walking into the restaurant for the first time, one of the first things I noticed was that there was a display of Japanese figurines beneath the sushi bar, though I'm not the kind of guy who would know which game/show the figurines came from. The restaurant has a very high ceiling and the sushi bar is elevated compared to the dining area, which makes for a less intimate experience. In addition, the reflective lighting made my task of taking photos very inconvenient (I tried my best). In either case, the servers were well-mannered, and even though there weren't enough customers to warrant them remaining in the dining area, I found the service to be more than acceptable during both of my visits. On my first visit (September 30), I ordered the Daily Assorted Sashimi, which came with 2 pieces each of salmon, tuna, tai and hokkigai. Overall, the sashimi was very fresh and well-executed. The Tuna Sashimi was neatly cut and exhibited a mild, salty flavour with no fishiness. It melted in my mouth, though I wish it had just a little more flavour. On the other hand, the Salmon Sashimi was rich in flavour and had a nice, smooth sheen. The Hokkigai Sashimi had the right amount of chewiness and was remarkably large. 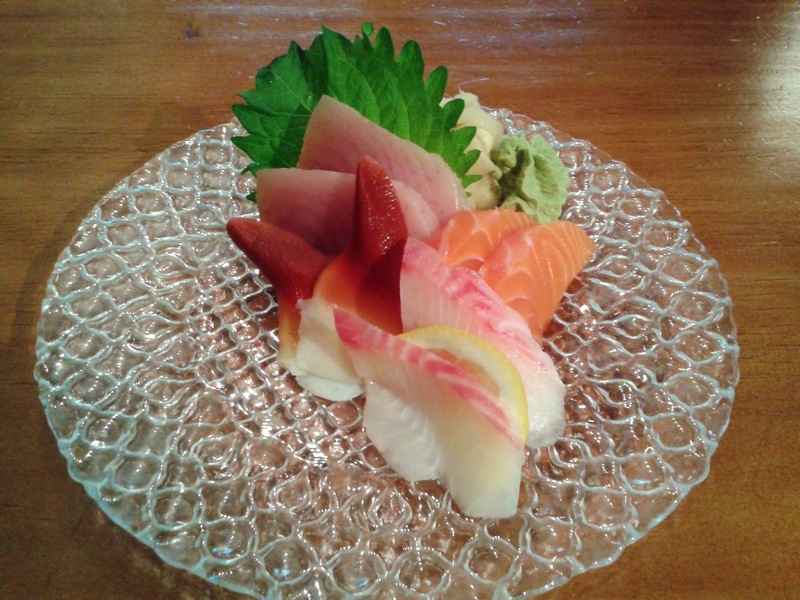 My favourite was the Tai Sashimi, which was cut thin enough to avoid excessive chewiness. It had the perfect delicate, sweet flavour and combined with a smooth texture, it was irresistible. 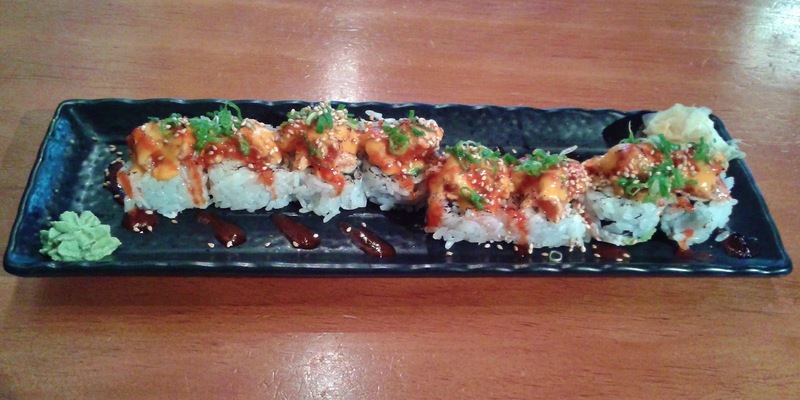 The BBQ Tuna Roll consisted of a California roll base, seared spicy tuna, spicy mayonnaise and green onion (negi). The pieces were on the smaller side, but the presentation was exquisite. I found the roll to be quite spicy (perhaps a little too spicy), but I liked how the spicy sauce (which had a sweet tinge to it) complemented the soft crab meat and accentuated the smoky flavour of the roll. 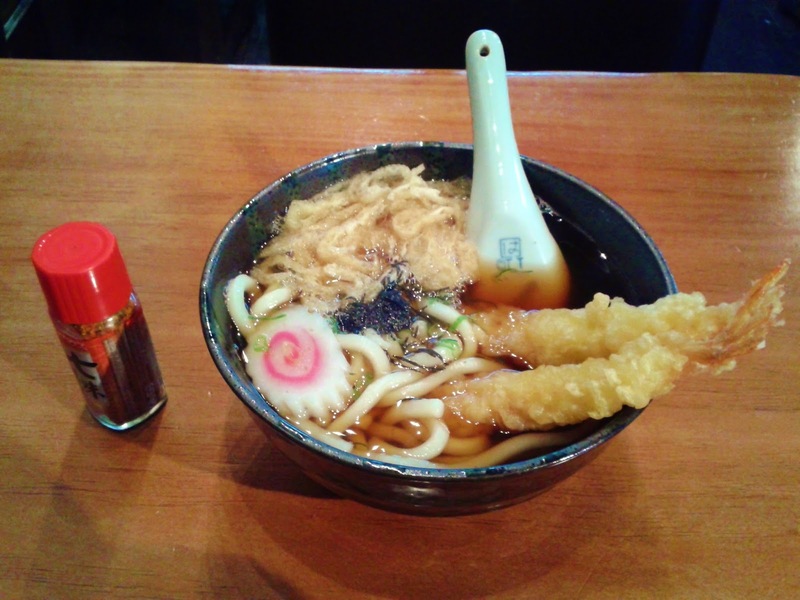 The Tempura Udon came with an appetizing, soft, thinly-sliced aburaage (fried soybean), two tempura prawns, one piece of narutomaki and some seaweed and green onion. The aburaage absorbed the moisture and flavour from the udon broth, which itself was on the stronger side. The slight but noticeable hint of mirin brought an extra dimension of flavour to the soup and made it taste more authentic. The prawns had an appealing, chewy texture though the batter was rather greasy (and soaked in the soup). The udon noodles had the right chewiness and had an even thickness throughout. 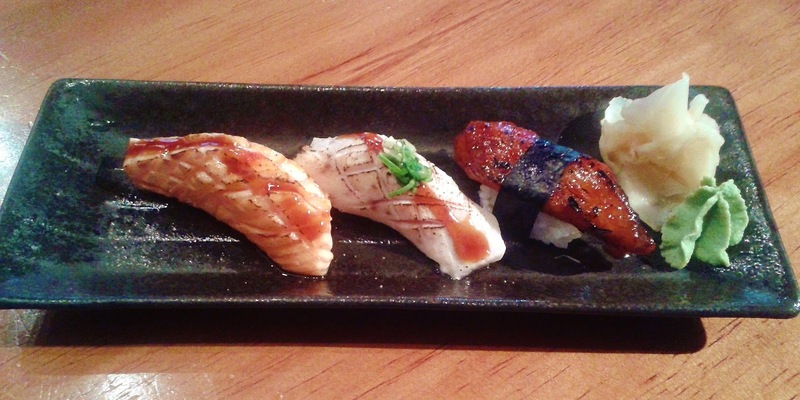 The sushi rice was soft and well-crafted and they nailed the fish-to-rice ratio on all three pieces of nigiri. (You have the option to ask for more rice under the nigiri at no additional charge.) The Aburi Salmon Belly Steak Nigiri was served with unagi sauce with a dab of spicy sauce, which gave it a mildly spicy aftertaste. It had a melty, smooth texture and was absolutely delicious. The Aburi Toro Steak Nigiri looked promising but unfortunately, it was overdone and the fish was cooked almost all the way through. It also needed more of a smoky flavour. The Aburi Tai Belly Kabayaki Nigiri tastes a bit like unagi, with a savoury, rich sauce covering a delightably soft piece of grilled tai. The Las Vegas Roll consisted of a dynamite roll base, seared spicy tuna on top, green onion, spicy mayonnaise and spicy sauce. This roll was moderately spicy and the tempura batter inside contributed a light crunch. The prawn contained a delicate sweet flavour and was noticeably soft. The tuna on top had a flaky texture - I wished it was a little softer. 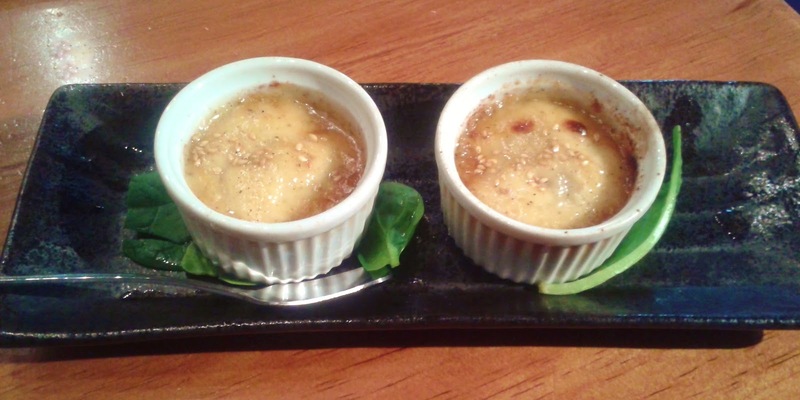 The Oyster Motoyaki was made with misonnaise (miso paste + mayonnaise). The miso paste and the mayonnaise each accentuated the other and made for a rich, smooth and creamy custard. There was a small, whole oyster in each of the cups and the taste of the oyster was somewhat moderated by the more powerful custard. Sesame seeds were sprinkled on top for added flavour, while the motoyaki could use a little less oil. Virtually all of the food was consistently well-executed and demonstrated thoughtful presentation and taste. The prices are well-justified and reasonable in my opinion, though the smaller portions explains the "higher priced" rating. In my three years of being a regular at Sushimoto, I have yet to experience a definitive miss in either the food or the service there. Well, if I ever decide to try 10-pin bowling for the first time at the bowling place next to it, I'll be sure to stop by Sushimoto for sushi afterward (as long as time permits! ).